Our specialty! We are the Pioneers of Parasailing in Costa Rica! Let us give you a bird’s eye view of the beautiful Manuel Antonio coastline from up to 600 feet above the Pacific Ocean. Parasailing with Aguas Azules is so easy and relaxing . . . anybody can do it! Completely safe and secure, Aguas Azules is fully licensed and insured and has an impeccable safety record. We have flown clients from 3 to 80 years old — all different shapes and sizes! 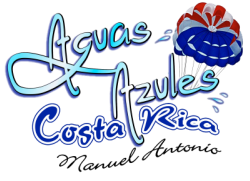 Anyone can parasail with Aguas Azules!!! Just get suited up in a harness and life jacket and get connected! And, enjoy spectacular views as you soar through the sky! Pass along the beach and say hi to all the excited spectators! Descend slowly and gently into the always warm and tranquil Pacific Ocean where will be waiting for you. And, take home memories from your fantastic and unique experience that will last forever! Parasailing with Aguas Azules is so easy, anyone of any age can do it!